The National Association of Professional Organisers (U.S.) claims that we spend one year of our lives looking for lost items. Clearly, we would have more time to spend on what is important to us if we didn’t waste all that time on looking for stuff we’ve lost. What is important to me? Books, art (film, dancing, photography, food…), health and love; your list might be different, but simplifying your life will give you more time to spend on those things, whatever your priorities are. Courtney Carver’s ‘Be More with Less’ online course tells you how to do this. I subscribed at the beginning of this year. Even though I was often travelling to interview selected Churchill Fellows in my book Inspiring Australians when the webinars were on, you can download them later so I still gained much from the course. I was on the right track already, since I’d once lived for a long time in a one-bedroom flat and had lived before that in tiny rooms in Corin House and Toad Hall and Burton and Garran student accommodation at ANU. I’d learnt to keep possessions to a minimum so I could maximize two necessities: space and light, plus have a serene clutter-free life. Now I live in a three-bedroom house with a vast study but it’s still important to do what Thoreau advised: ‘Simplify! Simplify!’ And now it’s important to simplify not only one’s possessions but do it digitally too – something with which Thoreau did not have to contend. Courtney Carver’s course helps with digital simplification as well. Courtney Carver ‘worked too hard and slept too little’ and became sick, and now has created a saner, healthier life for herself. She shares how she does it on her http://www.bemorewithless.com site, plus she invented Project 333 – Google that and see how she minimizes her clothes. Whoahh! This is too extreme, even for me. My take on things is: If in doubt, throw it out. But I couldn’t restrict my clothes to 33 items because clothes are self-expression and a way to enjoy colour and texture, but on my body, not just on my floors and walls. But you can adapt the 333 method and swap it for a more realistic number, like 66 or 100. 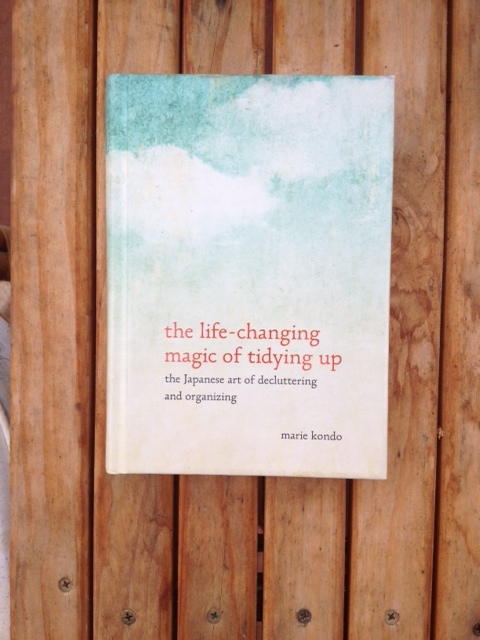 But the best thing of the whole course was her recommendation to read Marie Kondo’s The Life-Changing Magic of Tidying Up: The Japanese art of decluttering and organizing. (Berkeley, Ten Speed Press, 2014) This neat little book (translated beautifully by Cathy Hirano) is a gem, a delight. It will make you laugh. It makes me smile just to think of it. I’ve read a lot of these organizing-your-life books over the years and I’ve never seen one like this. It is original and profound. I give away lots of my books once I’ve read them but I won’t be parting with this one. It’s too precious. A couple of days ago I opened my Be More with Less email and there was a beautiful series of photos of North American lakes – a snow-covered path, a winter lake with grey satin water, misty pines … and the quotation was by one of my favourite American poets, Wallace Stevens: ‘Perhaps the truth depends on a walk around the lake.’ And I was just about to walk around my local one, Lake Burley Griffin! When I say ‘around’ I mean what we call the ‘Bridge to Bridge’ walk, which is about five kilometres. Takes about an hour. Walking does wonders for the mind as well as the body. On a long walk your subconscious will sort out problems and come up with a solution. Or the truth. Or at least a truth. You don’t do a PhD in a Postmodern department without being compelled to qualify ‘truth’! For example, the truth from whose perspective? From almost anyone’s perspective though, their lives would be improved by spending less time looking for lost things and thus having more time to spend on what is important to them.